The things people talk about. People often talk about salaries in London being higher than the rest of the UK. But I’ve never been convinced they’re high enough to cover the additional cost of living in the city. I was curious to see how this played out in America too. States like New York and California attract a lot of talent, but are you really better off working there? We set out to answer that question. 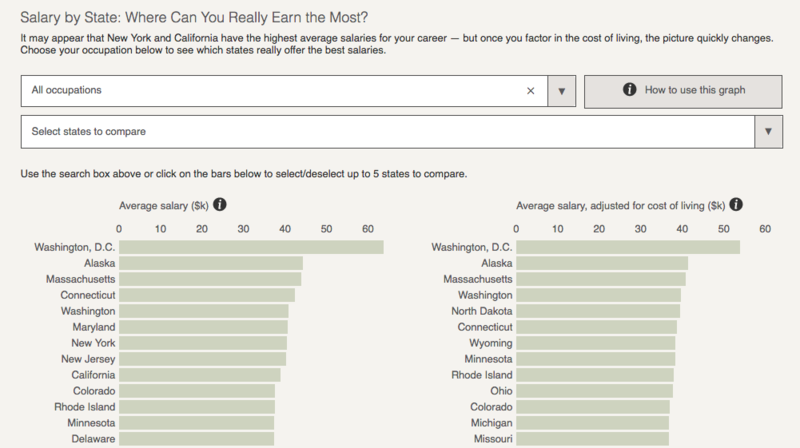 In this interactive chart, you select an occupation from the drop-down menu, then the bar graph on the left shows the average salary for that profession in each state. The bar graph on the right shows the same information adjusted for the cost of living in each state. Let’s look at the results for graphic designers. You can highlight any state you choose in the interactive. I’ve chosen four in the example below. For graphic designers, New York is the second highest state by average salary, but it falls to 9th when you consider the cost of living. Likewise, California drops from 4th to 14th. In the other direction, Rhode Island jumps from 7th place to 2nd, and Georgia leaps from 14th to 4th. Although we would have preferred to have data by city rather than state – and average salary doesn’t give you the whole picture – the content still reveals information that adds to the conversation.